The digital revolution has catalysed many changes in the way society functions, these range from instant news alerts to virtual reality gaming. The rise of technology has also boosted the healthcare industry in unimaginable ways. 70% of healthcare organizations worldwide will invest by 2018 in technology including apps, wearables, remote monitoring and virtual care. Earlier this month the FT reported that an app that identifies when a patient’s health is deteriorating by their log of symptoms and delivers a report, has helped to prolong the lives of cancer sufferers. This is by no means an isolated case, with medical technology improving exponentially. Health technology may be improving in leaps and bounds but this is not without investment. Galen Growth has estimated that venture funding in healthtech start-ups was over $5B last year. In fact, in mid-June CNBC reported that FundRx and angelMD are connecting wealthy doctors with medical startups. The high level of investment in the industry appears to be paying off, with Deloitte’s report on digital heath in the UK stating that the global healthtech industry could be worth up to £43bn by 2018. 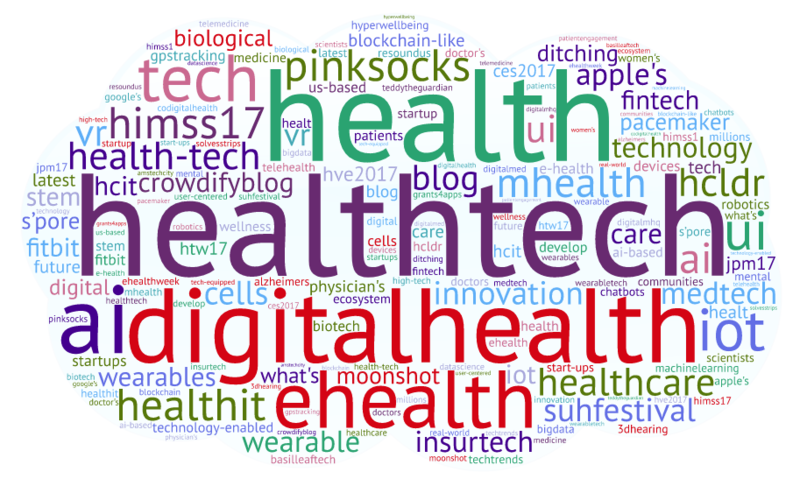 We were very interested in seeing which individuals, brands and publications were leading the social media debate around health tech, so we analysed over 812K tweets mentioning the key words: HealthTech OR ((Health) AND (Tech OR Technology)) or “digital health” OR digitalhealth from Jan 1st – June 25th 2017. We then identified the Top 100 most influential individuals, brands and publications leading the discussion. 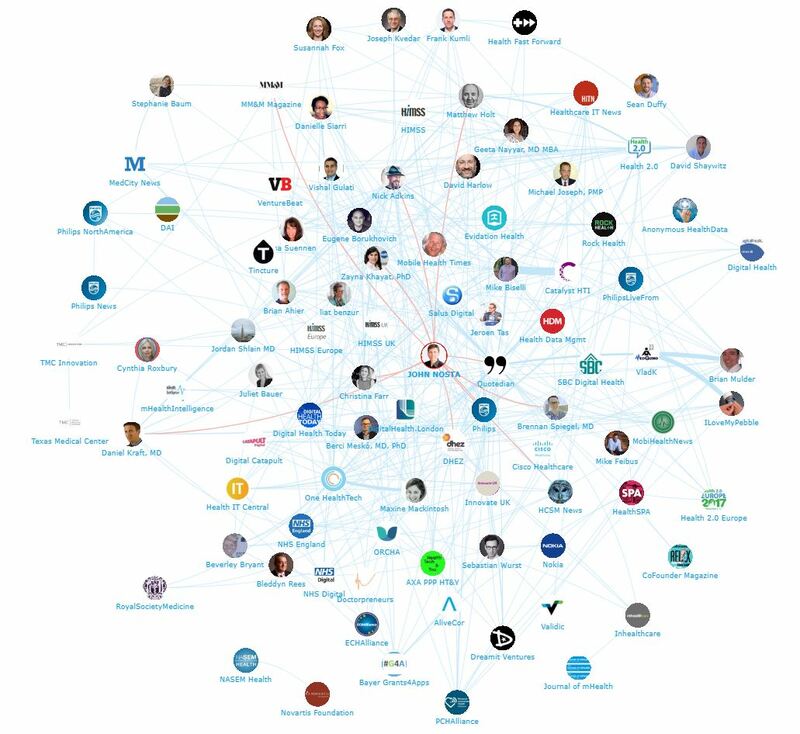 Below is a network map showing recent interactions with the number one influencer John Nosta. This map was created with our Influencer Relationship Management software (IRM). If you are interested in learning more about identifying, managing and engaging with influencers click here to get in touch! Below, you can find a pie chart showing the relative number of brand mentions by the key health tech influencers. This tells us which out of the top brands has the biggest share of voice among the top influencers discussing health tech, counting posts from 1st January – 25th June 2017. The most popular brand mentioned by the top healthtech influencers was the NHS with a 29% share of voice, illustrating the importance of the NHS’s acknowledgement that ‘digital’ has a significant role to play in sustainability and transformation, and it’s commitment to use the latest technology for information sharing. This includes making sure all patient records are digital and interoperable by 2020. Apple was the 2nd most popular brand mentioned by the top healthtech influencers with a 26% share of voice. This is not surprising considering Apple’s dedicated Health app now works with a growing number of apps and gadgets. Their ResearchKit open source framework is making it easier to build apps that can enrol participants, conduct studies, collect data and gain insights. Similarly Apple’s CareKit enables developers to build apps that help you manage your medical conditions, track symptoms and medications, and share the information with your care team. Bayer received the 3rd highest number of mentions with a 13% share of voice, Bayer conversations were driven by their Grants4Apps campaign, offering typically €50K to innovative healthcare startups. Intel received the 4th highest number of mentions with a 8% share of voice. Intel’s high-powered computers and analytics solutions are used to produce personalised treatments for patients including identifying genetic defects that cause different cancers. 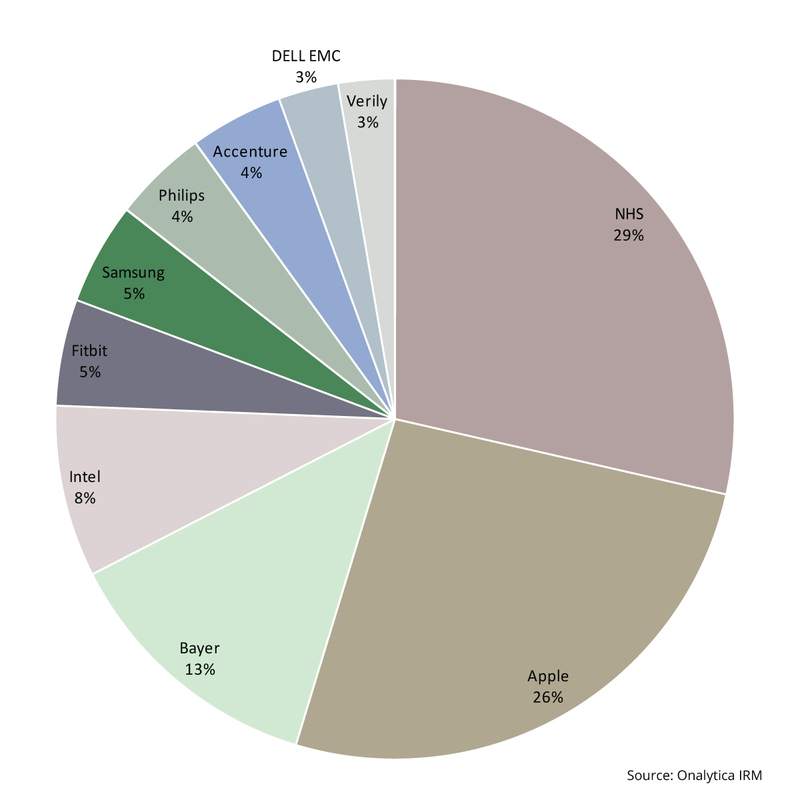 Fitbit has the largest market share out of the wearable fitness trackers, giving them the joint 5th share of voice among the health tech influencers together with Samsung. Accenture and Philips both received a 4% share of voice with Philip’s acquisition of medical device maker Spectranetics for $2.2 Billion gaining a lot of attention. Dell EMC received 3% of the mentions with mentions of the Dell Medical School leading the discussion as well as mentions of the IT solutions they provide to hospitals and pharmaceutical companies. Google’s research organisation Verily had the 4th largest share of voice with 5% of all brand mentions among the top healthtech influencers. It is interesting to see that after HealthTech, “DigitalHealth” is the 2nd most popular phrase used by the influencers. Other popular words and phrases include “ehealth”, “mhealth” and “healthit”. himss17 is a reference to the Healthcare Information and Management Systems Society conference in Chicago. The hashtag “pinksocks” is a reference to the pinksocks community who’s mission is to create and effecting change in healthcare system and share each other’s stories. 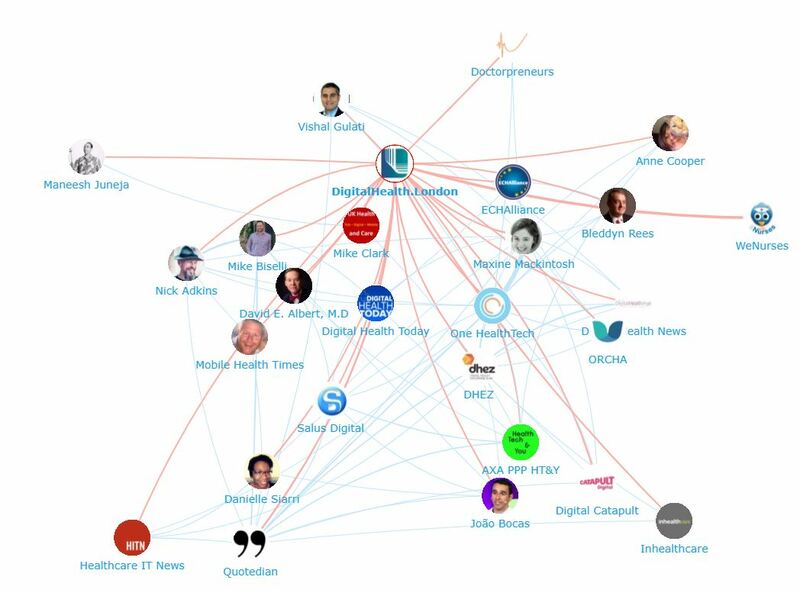 We looked at all the individuals engaging on Twitter to bring you a list of the top influencers around health tech. Below is the top 50, if you want to see who ranks from 50-100 be sure to download the full report by clicking the download button below. 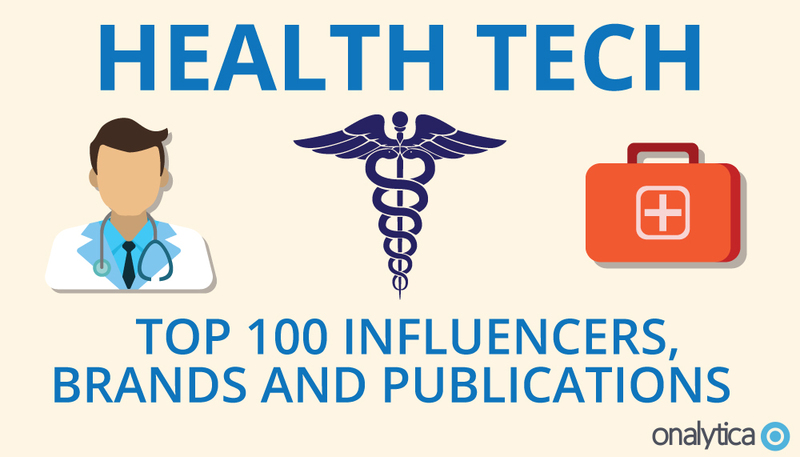 We also looked at all the brands engaging on Twitter to bring you a list of the top brands talking about health tech. Below is the top 50, if you want to see who ranks from 50-100 be sure to download the report to get the full top 100 list, and see who are most the influential brands in health tech. As part of our new analysis, we scanned all the publications engaging on Twitter to bring you a list of the top publications talking about health tech. Below is the top 50, if you want to see who ranks from 50-100 be sure to download the report to get the full top 100 list. At Onalytica we love building these lists and want to give back to our loyal readers as much as we can. 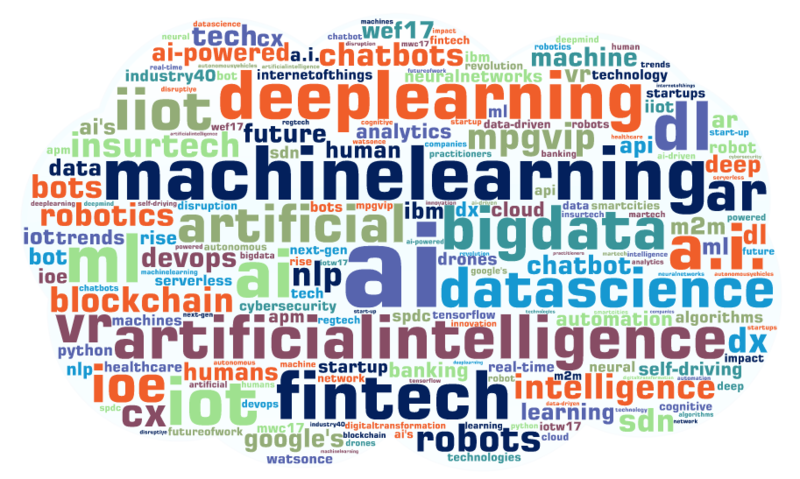 If you’re interested in other topics (such as Big Data, Virtual Reality, Digital Marketing) be sure to have a gander on our blog or why not propose some topics to us on twitter? We also build some very cool software to manage all of these influencers. Get a free demo today by clicking the button below! Disclaimer: As ever with these lists, it must be stressed that the ranking is by no means a definitive measurement of influence, as there is no such thing. The individuals, brands and publications listed are undoubtedly influential when it comes to driving discussion around healthtech. The PageRank based methodology we use to extract influencers on a particular topic takes into account the number and quality of contextual references that a user receives measured as resonance (engagement). These calculations also take into account a user’s relevance (number of tweets on topic) and reach (number of followers). If you want to learn more, please read our article that outlines influencer identification.